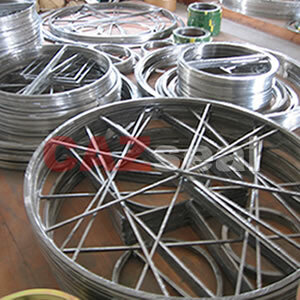 Description:CAZ Double Jacketed Gasket (DJG) is made from graphite, ceramic, non-asbestos etc. filler covered with thin metal jacket, such as stainless steel, carbon steel, copper etc. By their sealing efficiently, provide outstanding resilience, while the metal jacket guarantees excellent sealing and protects the filler against pressure conditions, fluctuating temperatures and corrosion. CAZ DJG is particularly suitable for sealing flat surfaces of heat exchanges, gas pipes, cast iron flanges, cylinder heads of engines as well as for boilers and other vessels. Other special metal Ti, Mon 400 are also available on request.